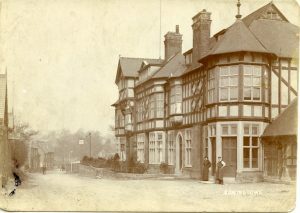 The Dukeries Hotel is situated just before the railway bridge on Rufford Road. 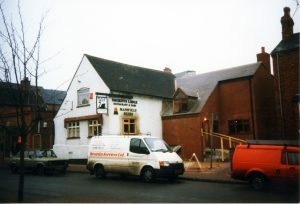 Mansfield Brewery purchased the site in 1895 for £543. 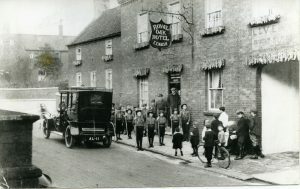 The licence was granted at the Retford Quarter Sessions on 21st October 1896 and the hotel was built in 1897. The effect of the coming of the Railway on Edwinstowe, according to newspaper reports. 1896 The Retford & Gainsborough Times. With a view to providing further hotel accommodation for the many thousands of visitors to the Dukeries, the Mansfield Brewery Company is erecting at Edwinstowe, on a site on the opposite side of the main Edwinstowe to Ollerton road to the station on the Lancashire, Derbyshire, and East Coast Railway Co.’s new line, a magnificent family hotel and refreshment rooms combined. It includes, on the ground floor, a coffee room, a private sitting room an office for the manager, a refreshment room, a bar parlour surrounded by a veranda, suitable for large assemblies and dancing, cloakrooms, lavatories, kitchens, a scullery, a larder and other necessary offices. The first floor contains further sitting-room accommodation, a large drawing room, numerous spacious bedrooms, a bathroom and lavatories, etc. The second floor comprises additional bedroom accommodation, stores and a tank room for storing water for domestic purposes and for use in case of fire. Spacious beer and wine cellars are also provided under the central portion of the building. Behind the main building commodious stables and coach houses are to be arranged, and the remaining part of the site will be laid out as pleasure gardens, with tennis courts etc. A picturesque style of architecture has been adopted as most suited to harmonise with the famous woodland greenery. The lower part of the structure will be faced with Leicestershire red sand-faced pressed bricks, relieved by white Mansfield stone dressings and the upper portion will be constructed of half-timber with cement panels. The principal entrance to the hotel is through the open timbered porch, above which is an overhanging gable in timber. The roofs will be covered with red Staffordshire tiles and ornamental ridging of a suitable character. 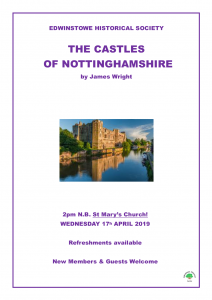 The building, which will cost between six and seven thousand pounds, has been designed and arranged by Mr Frank Wallace, FRIBA, of Mansfield, and the contractor is Mr J.F. Price, of Nottingham. 1896 The Retford & Gainsborough Times. ‘With a view of providing further Hotel accommodation for the many thousands of visitors to “The Dukeries” the Mansfield Brewery Company are erecting at Edwinstowe, on a site on the opposite side of the main road from Edwinstowe to Ollerton to the station on the Lancashire, Derbyshire, and East Coast Railway Co.’s new line, a magnificent family Hotel and refreshment rooms combined. It will contain on the ground floor a coffee room, private sitting room and office for the manager, refreshment room, bar parlour surrounded by a veranda, suitable for large assemblies and dancing, cloakrooms, lavatories, WC’s, kitchens, scullery, larder, and other necessary offices. The first floor contains further sitting room accommodation, large drawing room, numerous spacious bedrooms, bathroom, lavatories etc., etc. The second floor comprises additional bedroom accommodation, stores and tank room for storing water for domestic purposes and for use in case of fire. Spacious beer and wine cellars are also provided under the central portion of the building. Behind the main building commodious stables and coach houses are arranged, and the remaining part of the site will be laid out as pleasure gardens, with tennis courts, etc. This page was created by Margaret Woodhead on 16/03/2011. 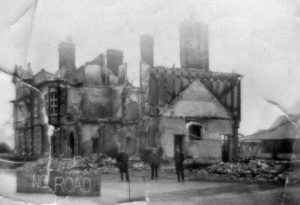 Disaster struck at the Dukeries Hotel on 9th February 1929 when, according to the newspaper ‘One of the most destructive fires in the Mansfield area in recent times’ broke out in the early hours of the morning. Mr Edward, who lived opposite, reported that his dog woke him and he looked out of his shop window to see the hotel a mass of flames with smoke pouring out of the bedrooms. He alerted the hotel and the fire brigades of both Edwinstowe and Mansfield. They were hampered by the hydrant being frozen up and water having to be pumped from the river. It wasn’t until 4pm that the Mansfield brigade was able to leave. The fire broke out again during Tuesday night, as the rafters were still smouldering, but the local brigade, under Mr. P. Morley, was still on duty. The Mansfield Brewery owned the hotel and the occupiers were Mr. & Mrs. Snaith. Mr. Snaith was overcome by the shock of the blaze and was taken to hospital. It is believed that the fire broke out in the neighbourhood of the vaults and that area, the billiard room; the smoking room and the bedrooms over were entirely destroyed. 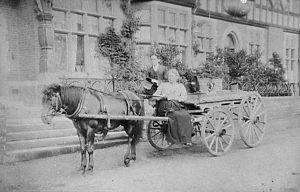 During the day the firemen were fed by Mrs. Watkin of the Jug and Glass, 23 luncheons at a combined price of £3.19s.10d. 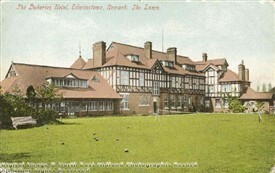 The hotel was rebuilt but to a modified plan and without the pavilion, which had been intended to feed groups of 200. In the book “Edwinstowe Past & Present” compiled by the Edwinstowe Historical Society in 1987 (p.39) it is recorded that The Mansfield Brewery purchased the site of the hotel (just across from the railway station) in 1895 for £543. 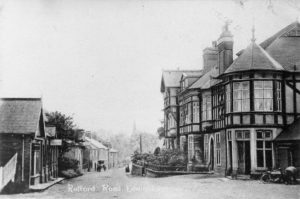 The licence was granted at the Retford Quarter sessions on 21st October 1896, and the hotel was built in 1897. 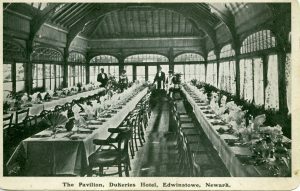 M.J. Jackson, meanwhile, in his book “Edwinstowe: The Story of a Forest Village” (p32) says “The Dukeries Hotel, vast in comparison with other village hostelries, was built primarily to cater for those coming into the village by train and during the summer months the number of visitors was considerable”. 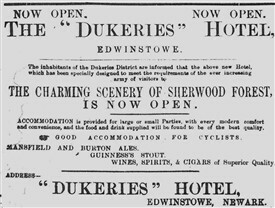 The Mansfield Advertiser (18th September 1896, p3 c3) recorded that, “With a view to providing further Hotel accommodation for the many thousands of visitors to ‘The Dukeries’, the Mansfield Brewery Company are (sic) erecting at Edwinstowe, on a site on the opposite side of the main road… to the Derbyshire and East Coast Railway Co.’s new line, a magnificent family hotel and refreshment rooms combined”. It said the hotel would cost about £7,000 to build, and that the architect was Mr. R. Frank Vallance F.R.I.B.A. of Mansfield. The paper continued with a detailed description of the exterior and interior: – Outside: “A picturesque style of architecture has been adopted as best suited to harmonize with famous woodland scenery. The lower part of the structure will be faced with Leicestershire red sand faced pressed bricks, relieved by white Mansfield stone dressings, and the upper portion will be constructed half-timber with cement panels. The principal entrance to the hotel is through an open timbered porch, above which is an overhanging gable in timber. The roofs will be covered with red Staffordshire tiles and ornamental ridging of a suitable character”. 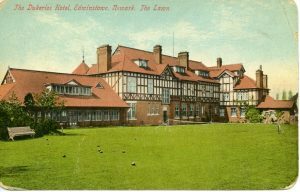 Inside: “[It will contain] on the ground floor, coffee room, private sitting rooms, billiard and smoke rooms, sitting room and office for the manager, refreshment room, bar parlour, pavilion 51 feet by 24 feet, surrounded by a veranda, suitable for large assemblies and dancing, cloak rooms, lavatories, w.c.’s, kitchens, scullery, larders, and other necessary offices. Looking at Trade directories, in 1912 and 1916 the manageress was Miss Charlotte Fox. 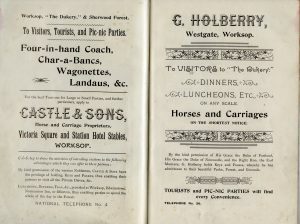 The next available directory – 1922 – then lists Edgar Handley Hind as proprietor. Hind appears again in the 1925 directory, but by 1928 has been superseded by H. Snaith. 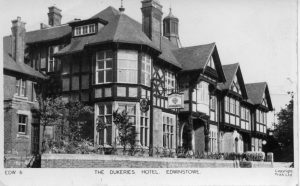 “The Dukeries Hotel is the property of the Mansfield Brewery Company, and was occupied by Mr and Mrs H Snaith, a daughter and son-in-law of Mr F. Oliver of the Dial Hotel, Mansfield. During Tueasday morning Mr Snaith was overcome by the shock of the affair and was removed to Mansfield. “One of the most destructive fires in the Mansfield area in recent years occurred in the early hours of Tuesday morning, involving the well-known Dukeries Hotel at Edwinstowe. More than one-half of the building was destroyed, and the portion remaining has suffered considerable damage from fire and water. 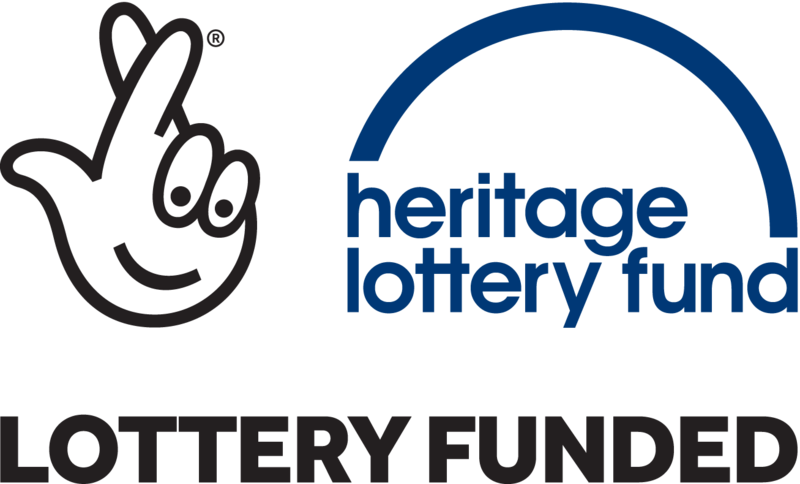 The total damage is placed at Between £12,000 and £15,000. 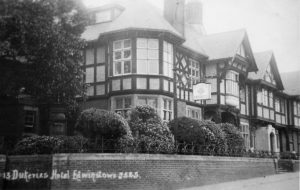 “The story of the discovery of the fire was related to a representative of the ‘Advertiser’ by Mr E.H. Edwards, who occupies a shop immediately opposite the hotel. 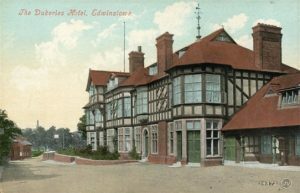 About 3.30 on Tuesday morning, stated Mr Edwards, his Alsatian dog jumped on to his bed and aroused him, and as the animal continued restless he got up and came into the shop, and on looking through the window saw the pavilion adjoining the hotel a mass of flames and smoke and flames were also pouring out of the bedrooms at that end of the hotel. “He then went to arouse the inmates of the hotel, all of whom were sleeping at the opposite end from the fire, but whose rooms were beginning to fill with smoke. 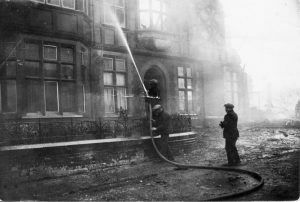 Mr Edwards summoned the Mansfield Fire Brigade by telephone, and also Mr P. Morley, captain of the Edwinstowe Brigade, but the latter were handicapped from getting to work on the blazing building owing to the hydrants being frozen up. “The call was received at the Mansfield Fire Station at 4.15, and the brigade, under Captain A. Colbert, with two engines, arrived on the scene at 4.47. ‘It looked an almost hopeless task,” said Capt. Colbert, ‘when we arrived’. “Some delay was experienced before the engines could be got to work owing to the stream from which water was pumped having to be cleared to immerse the suction. “In order to cope with the fire, the Mansfield brigade had to couple up forty lengths of hose, and the large engine was pumping water from the stream nearly a quarter of a mile away from the scene of the fire, for seven hours at the rate of 400 gallons per minute and giving a pressure from the jets of 120lbs. to the square inch. “After nearly five hours’ work the firemen began to get the mastery of the flames, but it was not until four o’clock on Tuesday afternoon that the Mansfield Brigade was able to leave Edwinstowe. “At mid-day spurts of flame were still to be seen shooting out from various parts of the ruins. The fire broke out again during Tuesday night among the rafters in that portion of the building which had been saved. The local brigade, fortunately, were still on duty and were able to extinguish the outbreak. 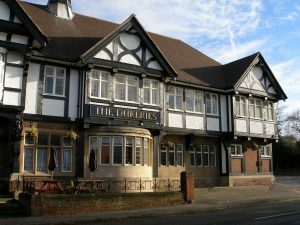 After eight years under the name of Ma Hubbard’s, The Dukeries name has been restored to this much-loved village landmark, built in 1896 to provide accommodation for the many thousands of visitors to the Dukeries. In addition to the new signs that have been put in place, the whole building has had a fresh coat of paint. Over the past eight years, Ma Hubbard’s has been a popular venue, especially for families to enjoy a meal out together. Mark Blow has been proprietor during this time. Also, due to popular request, the former tap room has now been reinstated. Mark is very proud of his hanging baskets that are planted out every year, with not only summer bedding plants but also with a selection of winter plants and greenery. He has installed a watering system to keep the plants looking good during the summer months. It is pleasing to see this lovely building maintained to such a high standard. My father saved clippings from local papers containing what he thought would be of interest to future generations. 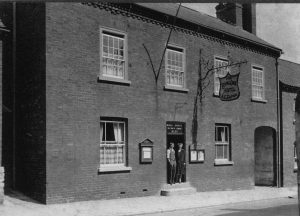 Two clippings have come to light recently regarding the vanished Inns and Hostelries in the Worksop Area. They were taken from The Worksop Guardian in the 1950s and the information was obtained from The Derbyshire & Notts. Post Office Directory for 1853. Some are listed here: Bothamsall The New Inn; Carburton- The Sun; Eakring- The Old Ostrich, The Horse and Trumpet; Edwinstowe- The Tally Ho; Kirton- The Hearty Goodfellow; Kneesall- The Old Black Horse; Ollerton Village- The Jolly Sportsman, The Blue Bell, King William IV, The Hop Pole, The White Hart, The Board. 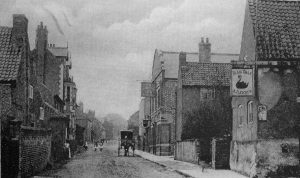 The Jolly Sportsman, believed to be on Wellow Road, also known as the Hit & Miss and, even earlier, as The Malsters Arms. 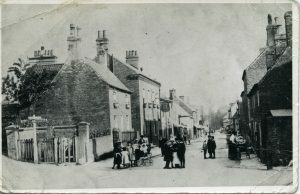 The Blue Bell, occupied the site of Maloney’s Â butcher’s shop, King William IV stood in the main street near the Hop Pole Garage, The Board, also known as The Gate, was on what is now Station Road, long before the station came. 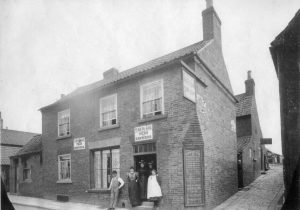 The hostelry at Budby appears to be called The White Hart, it was, a calling place for the mail coach running from Newark to Worksop, London to York. 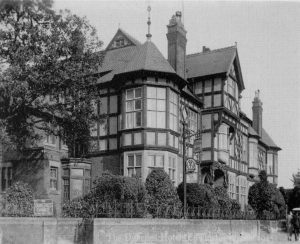 Rufford,- The Labour in Vain, The Tally Ho, on Ollerton Road, which is now Sir David Naish’s House. 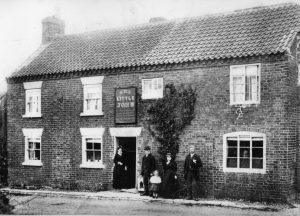 The Little John, in Edwinstowe, closed as an Inn in the 1890’s. It was opposite Sandy Lane on Rufford Road. 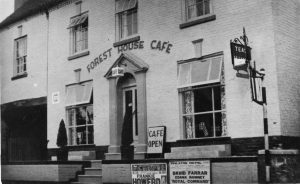 The Forest House Cafe, Church Street, in August, 1952 Now called the Forest Lodge, it and the nearby Sherwood Villa are thought to have been built about 1774. The Association was formed in1897 to provide transport for visitors arriving at Edwinstowe Station. 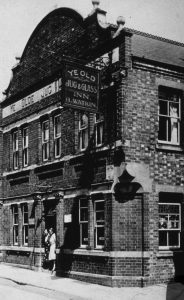 The Chairman was Mr. Naish, proprietor of the Royal Oak public house. 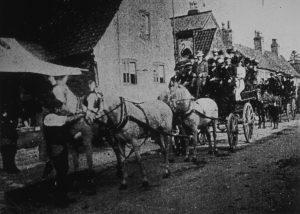 Visitors travelled by four- in- hand or wagonette to Rufford Park via Clipstone. 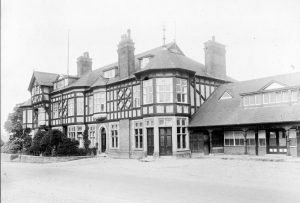 Refreshments were taken at either the Jug and Glass or the Dukeries Hotel. The excursion then continued to the Major Oak, the grounds of Thoresby Hall via Greyhound Lodge, Clumber Bridge and Lime Tree Avenue. Operators had keys to the grounds ducal estates. In 1898, the Duke of Portland threatened to close his estate because of dangerous overcrowding on the vehicles. 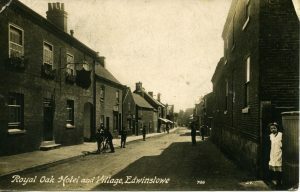 Edwinstowe High Street c. 1900. The Royal Oak is on the left had side. 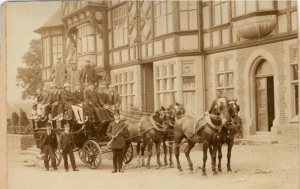 Visit of the Duke of Portland to attend the Dukeries Dinner at the Royal Oak Hotel on 31st December, 1912. Royal Oak Hotel c. 1929 showing Frederick Capon and his Mother. 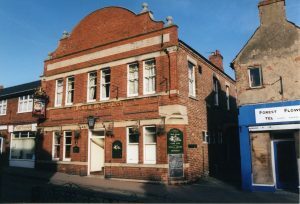 The Black Swan is the oldest building on the High Street. Parts of the building are thought to be 500years old. It has been a public house for many centuries. The building has been altered and extended considerably over the years. 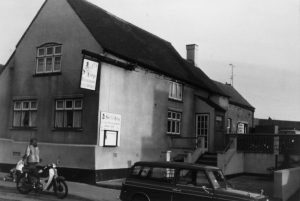 Sheriff’s Lodge – now Black Swan c. 1980. Deep wells were discovered near the Black Swan, also near the Royal Oak and Manor Farm. Piped water came to the village in 1905. The wells have been filled in. This photograph has Charles in bowler by the front window, his daughter Edith (Ann) in her teens to the left of the front door, a younger cousin Edith from Chester is in the pinafore dress to the right. Behind them is cousin Edith’s mother and maid. Looking from the side door is Ann, and at the top of the yard a groom is preparing a carriage. The Jug and Glass was home to Christopher Thomson’s Penny Library in 1838. Christopher Thomson was a former travelling player turned painter and decorator and early socialist. He and a group of likeminded people set up the library for the benefit of working men. On discovering that few could read he started night classes in1838. The Edwinstowe Artisans Library and Mutual Instruction Society charged a penny -1d- entrance fee and ran three nights a week. Classes were free but members provided their own coal, candles and books. Instruction was offered in reading, writing, arithmetic, music, drawing and conversation. An annual ball was held to raise funds and after nine years they had five hundred volumes of books. In 1844, Miles Webster installed gas lighting in his home on the High Street and in Ye Olde Jug and Glass next door. This photograph of the refurbished Jug and Glass circa 1920s, has Edith (Ann) Woodhead and her daughter Edith (Mary) Woodhead stood in the doorway. Charles widow Ann lived at the Jug and Glass. The Little John Inn was converted from three cottages situated on Rufford Road, opposite Sandy Lane. It traded as a public house until 1897 and then reverted to being a dwelling. The building was demolished c. 1950.